At the time when history’s defining events are taking place, they aren’t always recognised as being such defining moments. It takes a bit of hindsight to realise how significant they are. I’m sure that when the first man walked on the moon, there were plenty of people eating their dinner, feeding the dog, going to the office and just getting on with their lives. When the Germans invaded Poland, much of the world was just living their lives, oblivious to the impact of what might come next. Why do I mention these things? Because it’s not always necessary for a book set at a significant time to actually be directly about that time. History’s defining events can be the back-drop to a book rather than front of stage getting all the attention. Such is the case in Shaheen Ashraf-Ahmed’s short novel The Dust Beneath Her Feet. The book is set in northern India (it’s actually in Lucknow, but that’s not clear nor particularly important to know) at the time when India was preparing for Independence. Independence and the Partition are essential elements of the story and create the context in which the book evolves but these two major historic events are not the focus – merely the setting. There are hundreds of excellent books in which Partition and the killings that accompanied it are examined and explored in great details, but there’s something rather special and refreshing about a book where the impact is in the background. 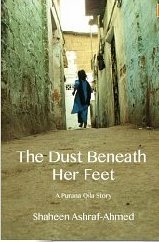 The Dust Beneath Her Feet is the story of a poor Muslim family in 1946 to 1947. Whilst their country was preparing for the most significant changes in 150 years, their lives are lived in a rather small way. The family have little in material ways but they have each other. The two daughters Laila and Henna live with their mother Safiyah and their father Aarif and their lives are those of poor servants. The first impact on their lives comes with the decision of Aarif’s employers, an English couple called the Buttles, packing up to leave India and head back to England. With their departure Aarif’s job disappears and the family are left without an income. No problem, Aarif will become a teacher. He will “change their destiny”. Aarif is a dreamer, a man with big ideas and small talents who takes the easy option whenever the hard one might have been more rewarding. After he helps rescue a wealthy man from an attack by muggers, he’s offered a job in his house and the plans for being a teacher are dropped. Surely he can work his way up the ladder in the house of Masood Sahib and his wife Alima Begum, get a better role and become a more important man in the household. But Aarif is impatient, he does something that it’s hard to believe his employers can forgive and runs away to the Punjab to get a new job, to make his fortune and to “change their destiny” once again. I’m not sure whose feet the dust is beneath in this book since interestingly the three female characters are quite balanced in their page time. Is our heroine young Laila, viewing events through the eyes of a small child, or is it Safiyah, striving to survive and protect her daughters with her husband far away? It’s not clear and it doesn’t matter. There are some horrible people in this book – there’s an evil landlord, there are spiteful children in the playground and Aarif himself is hard to like. In the background hundreds of thousands of people are killing or being killed but it’s the small cruelties that impact directly on the lives of the family. More importantly there are acts of great kindness, some of it quite unexpected. Masood Sahib and his wife are generous to a fault, educating the girls and sending their son to walk them to school when racial tensions make their journey unsafe. When things get really hard for the young mother, her sanctuary comes from a Christian family with a disabled son who might be expected to have had more than enough troubles of their own. If you like a book where everything knits together neatly at the end, then you may not appreciate this one. I like the ending because of its ambiguity, not in spite of it. Nothing is completed and the reader is left with many unanswered questions. When the line is drawn across the map will Aarif find himself in Pakistan instead of India? Will Safiyah be saft to go off and search for her husband at such a dangerous time? Are the rumours her children have heard about his new life true? And should she take her children with her or leave them with her friends or her patron? It’s the kindness of others towards a young woman who has no husband or local family to protect her that gives this book a glow of reassurance. History shows that many good people did not close their doors or turn a blind eye to the troubles of others caught up in Partition and this presents that alternative reality in a small way. A more powerful story might have come if the author had laid on the tragedy and violence with a heavier hand but I’m glad that she didn’t. It’s the lightness of touch combined with the beautiful prose that makes this short book one whose story stays with the reader for a lot longer than it takes to read. With thanks to the author for providing a review copy. 2 Comments on "The Dust Beneath Her Feet"
What an excellent review. To know in advance that the events take place against the backcloth of Independence and Partition and yet they don’t become the story is important as we’re left to follow the characters. Perhaps I may have favoured a tidy ending but since life is seldom tidy, I can adjust to that. You have helped bring the book to life here and make it obvious that the author has done a grand job with her writing. I have signed to follow this blog and look forward to many more reviews of such quality.